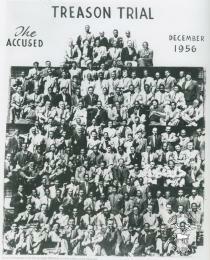 Description: This is a black and white photograph of all the Treason Trial defendants taken by ANC photographer, Eli Weinberg in December 1956. He had originally planned to stage this group picture in Johannesburg's Joubert Park, but permission was withdrawn on learning by a government official that blacks and whites were to be seated together. 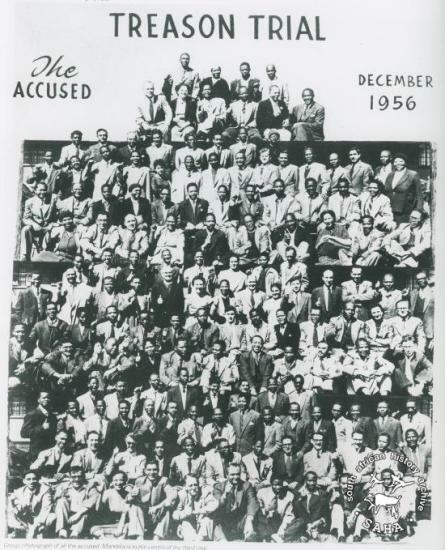 The defendants were then photographed in smaller groups and Weinberg prepared a montage. This photograph was digitised by Africa Media Online (AMO) in 2009. Included in SAHA online repository on non-racialism 'Tracing the unbreakable thread'. Rights: User restrictions may apply. See SAHA copyright statement for more information.